"Basilar" redirects here. For other uses, see Basilar (disambiguation). In human anatomy, the basilar artery is one of the arteries that supplies the brain with oxygen-rich blood. The basilar artery lies at the front of the brainstem in the midline and is formed from the union of the two vertebral arteries. The basilar artery terminates by splitting into the left and right posterior cerebral arteries. 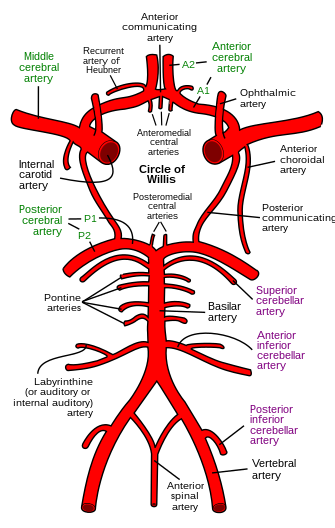 Pontine perforating branches, anterior inferior cerebellar (AICA) and superior cerebellar arteries, and terminal posterior cerebral arteries. Pons, and superior and inferior aspects of the cerebellum. The two vertebral arteries and the basilar artery are sometimes together called the vertebrobasilar system, which supplies blood to the posterior part of the circle of Willis and joins with blood supplied to the anterior part of the circle of Willis from the internal carotid arteries. The basilar artery arises from the confluence of the two vertebral arteries at the junction between the medulla oblongata and the pons between the VIth cranial nerves. It ascends superiorly in the basilar sulcus ventral to the pons and divides at the ponto-mesencephalic junction into the paired posterior cerebral arteries close to the pituitary stalk. Paramedian perforating arteries arising either directly from the dorsal surface or from short circumferential arteries running around and into the pons supplying the corticospinal tracts and vital deep nuclei. the anterior inferior cerebellar artery (supplying the inferior and middle cerebellar peduncles of the cerebellum) and the adjacent hemisphere). A basilar artery stroke classically leads to locked-in syndrome. The arteries of the base of the brain. Basilar artery labeled below center. The temporal pole of the cerebrum and the cerebellar hemisphere have been removed on the right side. Inferior aspect (viewed from below). ^ a b Byrne, James (2012). "Chapter 2. Cranial arterial anatomy". Tutorials in endovascular neurosurgery and interventional neuroradiology. Berlin: Springer. pp. 37–38. Wikimedia Commons has media related to Arteria basilaris. Anatomy photo:28:09-0204 at the SUNY Downstate Medical Center - "Cranial Fossae: Arteries, Inferior Surface of the Brain"